Centralization and systematization of insurgent formations continues, in order to create the so-called “Army of Novorossiya.” As of this time, it has been decided to form 7 mixed (infantry) brigades, 1 artillery brigade, 1 tank brigade, and a number of detached battalions. The practical implementation of these ambitious plans encounters such problems as acute staff shortage (made worse by the increasing number of deserters), the unwillingness of local gang commanders to obey the unified military command, and a number of issues related to organizing centralized and regular supplies of equipment and armaments for the “Army of Novorossiya” from the Russian Federation. Additionally, existing weaponry requires creating and developing an appropriate operation and repairs base. At this time, the latter issue is being addressed by fragmentary use of the machine-building and repair capacities in the region. However, a “regular army” will require specialized capacities and a large number of trained specialists (at this time, that role is filled by representatives of the Russian Armed Forces, who are keen to “delegate” their duties to local insurgents). Currently, the “LNR” [Luhansk People’s Republic] and the “DNR” [Donetsk People’s Republic] see no way of solving the above problems. The task group of Russian-terrorist troops that previously took part in combat near the Donetsk Airport and Avdiivka has been spotted in the northern districts of Donetsk. The group has up to 20 armored vehicles, up to 30 cannon artillery systems, and a large number of mortars. After the losses incurred in battles for the Donetsk Airport, this group is being replenished, mainly with Russian mercenaries and contract soldiers of the Russian Army. Many buildings, including residential blocks and production facilities, have been destroyed in Avdiivka as a result of fire strikes and shelling by Russian-terrorist troops. Local residents are convinced that those strikes were made by Ukrainian troops. However, objective firing data (including projectile landing trajectories) show that the strikes were made by the artillery of Russian-terrorist troops. 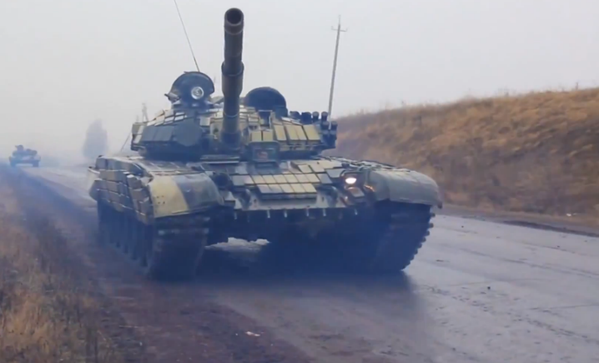 Additional insurgent formations arrived near Horlivka as reinforcements. We received reports about units of the so-called “Oplot” brigade, up to 2 reinforced companies. The insurgents are armed with light and heavy infantry weapons, including mortars and grenade launchers. This area also saw the arrival of up to 6 armored vehicles, repaired after the clashes near Vuhlehirsk. We have reports of Russian-terrorist troops concentrating in the area of Vuhlehirsk and Krasnyi Partyzan. At one of the latest meetings with the command staff of the newly-created “Horlivka Brigade,” the terrorist leaders were given a task to restore complete control over the Horlivka – Donetsk motorway (at this time, a large section of the motorway is controlled by the Ukrainian military). Up to 5 tanks of Russian-terrorist troops were spotted arriving at firing positions near the Bakhmut motorway. Several enemy artillery batteries armed with 122-mm Gvozdika 2S1 self-propelled howitzers were maneuvering between firing positions in the same area. Individual instances of enemy artillery fire were reported in this area.